Today by popular request I’ve compiled a list of what I brought with me on my Europe trip in carry-on form. It’s been over a month since I’ve been back home from our three week trip – sorry it’s taken me so long to publish this post – it took me a while to figure out how to photograph and edit everything. I’m still missing Europe very much and it took me a while to get adjusted back to reality. I hope to go back again very soon. To recap, my husband and I spent three weeks traveling through Europe. We traveled to 9 cities via 7 flights and one 7 day cruise. It was my husband’s decision that we travel with carry-ons only. His logic behind this decision was based on a number of things: we would avoid long lines at airport check-in, we’d save time from having to wait at baggage claim, we wouldn’t have to worry about lugging heavy suitcases around Europe, and we could try to look less touristy. I had no intention in participating and had plans to pack regular suitcases like normal people do. However after doing a lot of research on airline reviews (there are so many horror stories about bad experiences) I decided to make it work with carry-on bags. I’ve traveled with carry-on suitcases that fit US Airline standards but European Airlines have different dimension restrictions on luggage. All the options in the US are larger than what European Airlines list as acceptable. I didn’t want to risk it so we decided to go the backpack route. My husband helped research travel backpacks and day packs. He picked out this Pacsafe Venturesafe 45L GII Backpack. It worked to fit all of his clothes, flip flops, and laptop. He’s over 6 feet tall and it worked for him, but I’m 5’3″ so this one didn’t work for me. We looked for one a bit smaller and I opted for the Ultimatesafe 22L version. 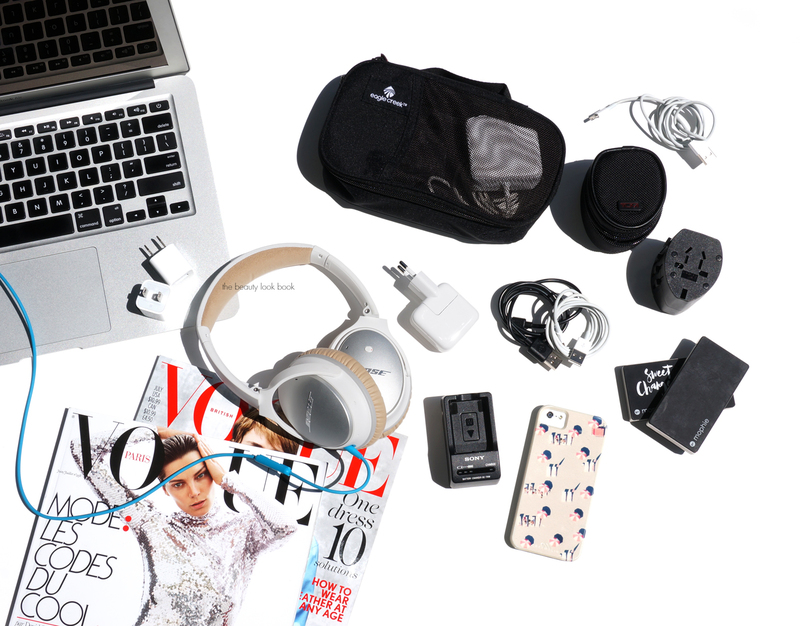 This combined with my Tumi Voyageur Tote (mine is an old model, current ones here) is what I brought with me on our trip. Inside each of my bags shown above, I used several things to organize and compact my items. If you order items directly from J.Brand they will send denim and tees packed in these nifty black pouches (shown on the far left). I’ve kept them from previous orders and brought 2 of them with me to keep tops in one and jeans in another. I know people usually say roll your clothes. I think it works with regular rectangular shaped suitcases. I found flat packing to be better for me, but there’s really no right or wrong. We also used a number of the Eagle Creek Packing Cubes. I brought three: one small one for electronics, one for clothes, one for small items such as socks, underwear and swimsuits. (My husband brought and packed the Translucent Specter Pack-It Cubes). Another item I packed was the Eagle Creek RFID-Blocking Undercover Money Belt. I only used this a few days when we did sight-seeing activities where we wanted to be hands free. We used a number of Muji Clear Pouches (featured in this post here) that we found really handy. It kept things organized and easy to find. Many have asked for a very specific list of everything I brought with me. I’ve split it up into categories to help make things easy to view. First up include electronic devices. I brought multiples of some items since both my husband and I had our phones, laptops and one iPad. For our flight I splurged on the Bose QuietComfort 25 Acoustic Noise Cancelling Headphones. They were well worth the high price. 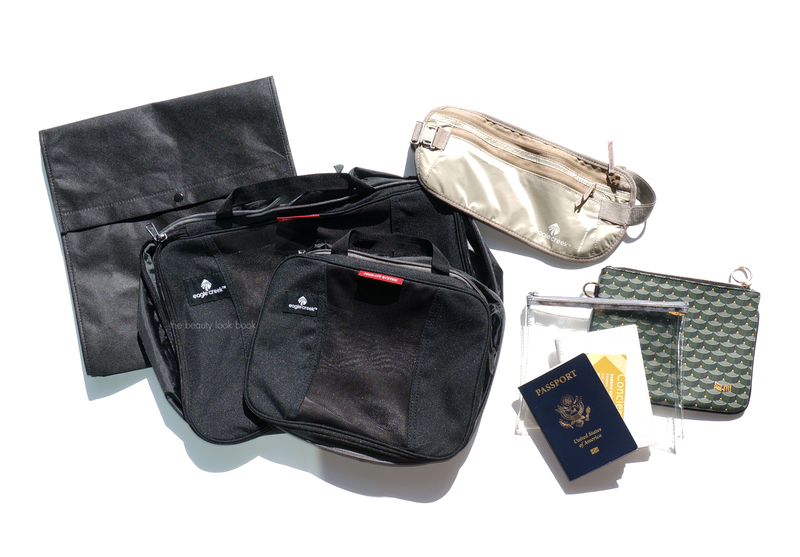 These make a world of difference and are really great for long flights. I brought one Tumi USB Travel Adapter and several Apple plugs, cords and the World Travel Adapter. For charging I had one for my camera. These Mophie Powerstation Chargers are lifesavers. I brought two and it was definitely worth bringing both of them on our trip. I use them in everyday life too. Having an extra one charged up in my purse is great for times I have super low battery. I kept most of our electronic plugs and cords stored in the smallest size of the Eagle Creek Black Pack Cubes. Onto the clothes I packed. We spent our first week in Paris and second week in Rome, but my mind was set on our cruise through Greece. 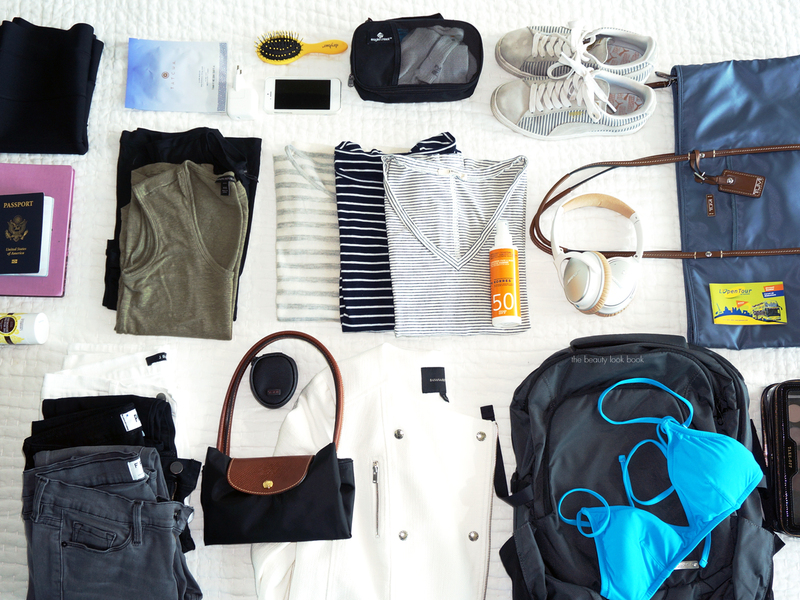 Here are the clothes I packed. Most items were thin in material and I’m petite so it was relatively easy to keep everything compact to fit into my backpack. Keep in mind I had one outfit on at all times, so everything pictured below minus one outfit was what was packed in my carry-on. The tanks and tees worked really well for warm hot weather. The ones I brought were lightweight in material so they folded up easily and didn’t take up a lot of space. I brought two casual dresses with me. In hindsight we both should have brought at least one nice outfit but we kept thinking our vacation would be a relaxing trip. Also if we needed something more formal, we could just buy something in Paris or Rome. Due to the limited luggage space we didn’t buy any clothes. We had to pass on several restaurants we wanted to go to because we didn’t have anything formal enough. In the end though we had a really good time and had lots of fun so it didn’t matter. Next time we know to pack differently. I brought two sweaters with me and two long-sleeved tees. One tee I threw away on the trip as well because I ripped it and it was beyond saving. J.Crew makes the best long-sleeve tees I’ve tried, they have lots of colors and I like the stripe ones. One soft cardigan was packed on day trips for places I needed to have shoulders covered. In the hot summer heat there were days I would have died if I wore long-sleeves the entire day so having a light weight sweater rolled up in my purse was a lifesaver. I packed one jacket which worked well throughout the trip. For bottoms, I could have skipped one pair of jeans (probably would have left the white ones at home). Having four pairs of shorts was definitely good for me. I packed one skirt to wear out at night with any of the tops shown above and one pair of yoga shorts to sleep in. Miscellaneous items include three swimsuits (I could have been fine with two), 1 pair of flip flops and 1 pair of sneakers. Many asked if I thought bringing the Pumas over Nikes was a good idea. Let me first say that I usually hate sneakers. I’m a flats or sandals kind of person, but I needed a good pair of walking shoes for our trip. The Pumas worked really well – they did take 2-3 days to break in. After wearing them for 3 weeks walking hundreds of miles, I have to say that I do like them and give them a thumbs up. If I were to do it over again though, I would have brought Nike sneakers instead. In my experience they just feel a lot better. For an everyday tote, having something with fully closed zipper at the top was essential. I didn’t have to worry about pick pockets. A simple canvas material is also non-flashy and doesn’t draw unnecessary attention. I opted for the shoulder version which worked just fine. It’s small enough to fit my petite 5’3″ frame but large enough to hold my camera, wallet, water bottle, sweater and then some. 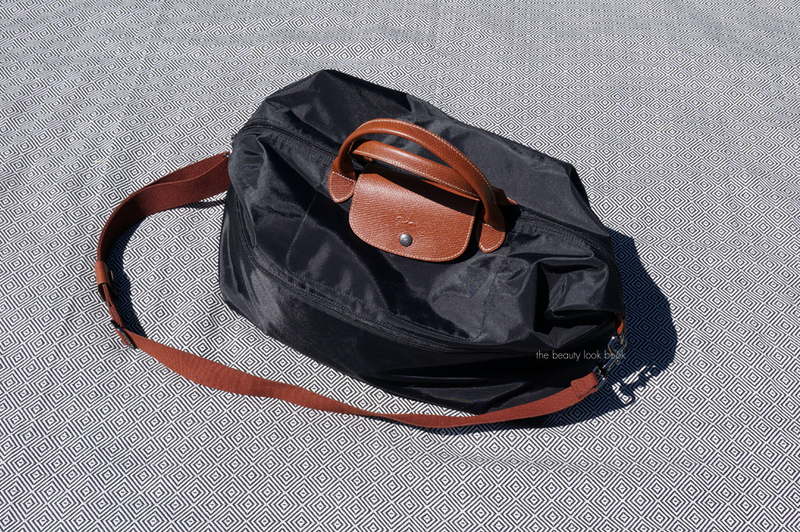 Cross-body bags might be a good option if you have a very compact camera. I found it difficult to find one suitable for all my needs so the tote was the next best thing for me. We made the carry-ons work. I brought one backpack and one tote. My husband brought one backpack. After our first week in Paris we decided to buy one Longchamp Expandable Tote to carry souvenirs and disperse some clothes so they weren’t all squished. 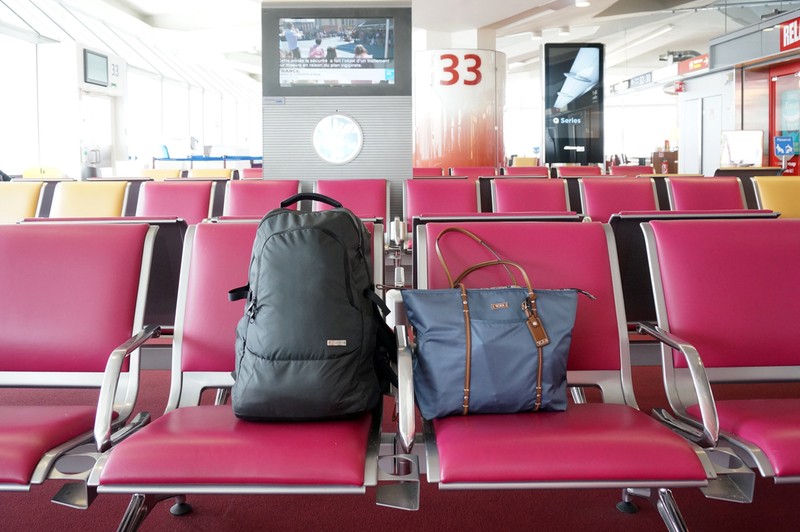 It was the largest carry-on tote we could find at a relatively affordable price. The sales rep who helped us said he knew for a fact all European airlines would consider this acceptable so we bought it. I like it because you can unzip it around the middle to expand it. It comes with a large over the detatchable shoulder strap. My husband on the other hand hates it. He prefers bags that have some support, structure or decent pockets. This one is just an open nylon tote. It’s very sturdy and durable but it has no shape so you can fold it and put it away easily. If we could go back in time and do it all over again there is not much we would change given our itinerary. We had a lot of stops and quite a few flights. I can’t tell you how relieved we were at the airport when we were able to skip lines to check and weigh bags. Most airlines have weight restrictions but as long as your bag doesn’t look heavy we found most didn’t weigh our carry ons. My backpack at the heaviest was 17.3 pounds (most weight limits were around 19-20 pounds). It was a bit challenging but it’s definitely do-able. We would have definitely packed 1-2 nicer outfits. I would have brought one nice pair of shoes. To make room for those I could have skipped a lot of the beauty or skincare items I packed. Paris has so much to offer, I could have relied on pharmacy minis for the entire trip. Our next trip to Europe will consist of fewer destinations so we will definitely be taking regular suitcases. It was all our flights and stops that made us decide to do carry-ons only. Had we planned to stop in 2-3 places, suitcases would have been the way to go. I hope you found this post helpful! I don’t think there’s a right or wrong way to travel. I know many who travel with carry-ons only all the time and they make it work.